OXFORD, Miss. – The University of Mississippi Libraries’ Department of Archives and Special Collections collaborated with the UM Museum to host “No Two Alike,” an exhibit of unusual materials from Mississippi artists and unique art publications from Special Collections’ rare book collection. 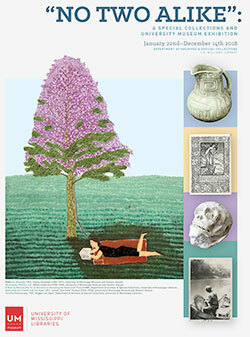 The exhibit, open through Dec. 14 in the Faulkner Room of the J.D. Williams Library, includes paintings, pottery, woodcarvings and sculpture from the museum paired with archival materials from Special Collections to provide context. 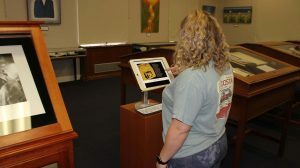 The exhibit also features four iPad stations, offering an enhanced view of selected pieces in the display. Visitors can find pottery from Biloxi artist George Ohr, whose “No Two Alike” description of his work helped create the exhibition title. The display also includes paintings and handwritten notes from Theora Hamblett, woodcarvings from Sulton Rogers and original sculptures from blues musician James “Son” Thomas, among many other materials from different artists. Also showcased is an original copy of William Faulkner’s handmade book “Marionettes,” as well as cartoons drawn by Pulitzer Prize-winning author Eudora Welty. This collaboration brings significantly meaningful educational value to the audiences that study and reflect upon the various collections housed at the university, he said. 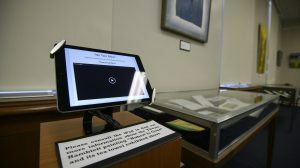 Ford said the exhibit would not have been possible without the efforts of the entire Special Collections staff and Saarnio and the museum staff, especially collections manager Marti Funke, along with UM videographer Mary Stanton-Knight. She also credited the support of Cecilia Botero, dean of university libraries. “Robert and his very talented staff could not have been more enthusiastic and encouraging throughout the planning process and execution of the installation,” Ford said. The exhibit, on the third floor of the J.D. Williams Library, is open to the public 8 a.m.-5 p.m. Mondays through Fridays, excluding university holidays. For more information, contact Ford at jwford@olemiss.edu or call 662-915-7408.